File photo of security guard Rolly Panesa, who the military claimed is a ranking communist rebel but who the Court of Appeals said is a victim of ‘mistaken identity’ and ordered released, showing his badly battered face, the result human rights groups have said of being tortured after his arrest in Quezon City October last year. MANILA, Philippines — The Court of Appeals has ordered the release of a security guard who the military arrested last year and accused of being a ranking officer of the Communist Party of the Philippines. In its August 27 decision, the CA’s Fifth Division said it was “convinced that this is a case of mistaken identity” as it granted the writ of habeas corpus sought by the family of Rolly Panesa and ordered the warden of the Security Intensive Care Area of the Metro Manila District Jail in Camp Bagong Diwa to free him. The decision could open the military to countercharges by Rolly Panesa, who was arrested by the military and police in Quezon City on October 5 last year and who the Armed Forces of the Philippines has been insisting is Benjamin Mendoza, the alleged CPP leader in the Southern Tagalog region. “The arrested and detained person, Rolly Mira Panesa, is not the same person as ‘Danilo Benjamin Mendoza’,” the CA said. “This Court will not further want to hold in detention a person who is not Danilo Benjamin Mendoza, accused of rebellion, murder, frustrated murder, etc.,” it added. The CA decision came about two weeks after the AFP handed out rewards for the capture of rebel leaders, including P5.6 million for “Mendoza,” which prompted the human rights organization Karapatan to accuse the military of running an “organized racket” of bounties for fake rebels. Karapatan and the NUPL also accused the military of torturing Panesa severely, releasing photos soon after his arrest showing the security guard’s badly battered face and other injuries. The 23-page decision indicated that most of the evidence presented by the military actually helped demolish its claims against Panesa. Aside from this, the appellate court also said the police had lied when it claimed that the informants who had identified Panesa as Mendoza “were with them before and during the arrest” of the security guard. The only time the informants saw Panesa, said the court, was in a room at Camp Vicente Lim where the security guard was placed by himself. On the other hand, it said that the operations manager of the security agency Megaforce “was straightforward in testifying that he personally knows Rolly Panesa as a pro-guard/pioneer guard of Megaforce, having been in their employ since 1995” and also submitted records of Panesa’s Social Security and Pag-IBIG contributions. It also called for the prosecution of those responsible for handing out the reward for the capture of what the CA has now ruled was the wrong person. Karapatan dared the Philippine Army of the Armed Forces of the Philippines to prove before the Court of Appeals that the man they arrested illegally and tortured is indeed who they claim to be in their press releases as CPP’s high ranking official ‘Benjamin Mendoza’ “because clearly, they picked the wrong man,” Cristina Palabay, secretary general of Karapatan said at today’s hearing at the Court of Appeals for detained Rolly Panesa’s Petition for Habeas Corpus. “Panesa has been in jail for three months since his abduction on October 5, 2012, yet the government has not presented any document to prove their claim. The man should be immediately released and indemnified,” Palabay said. Marites Chioco, Panesa’s common-law wife and petitioner to the habeas corpus case, submitted to the court Panesa’s birth certificate, baptismal certificate, school records, records of his employment, Social Security System Identification Card, Philhealth Card, driver’s license, NBI clearance and a certificate that he has gone through a training for the CAFGU. “These are all government-issued documents and not one government agency has come out to say that these are fake documents. 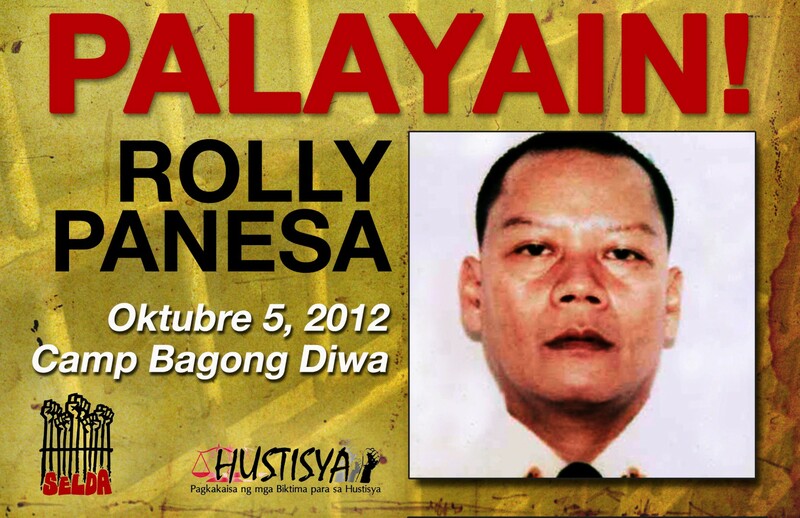 The AFP should admit its error because of arbitrariness on arresting Panesa,” added Palabay. Panesa is currently detained in Security Intensive Care Area (SICA), Metro Manila District Jail. According to Palabay, Panesa has been in jail for 100 days now for “mistaken identity.” Panesa, a security guard of Megaforce Security, was tortured to force him to admit that he is “Benjamin Mendoza” whom the military alleged as a high-ranking CPP official with a 5.6 million peso bounty. Panesa was abducted by joint elements of the 2nd Infantry Division of the Philippine Army, led by Southern Luzon Commander Maj. General Alan Luga, and the Philippine National Police. MANILA, Philippines—The family of a security guard allegedly taken by the military after he was mistaken to be part of the Communist Party of the Philippines asked the Supreme Court to order his release from detention. In a 9-page petition for a writ of habeas corpus, Marites Chioco, common-law wife of detained security guard Rolly Panesa, 48, said the military took her husband mistaking him for a certain Benjamin Mendoza, 68, the secretary of the CPP in Southern Luzon with a P5.6-million reward for his capture. Panesa, she said, was arrested on October 5 by joint elements of the 2nd Infantry Division of the Philippine Army led by Southern Luzon Commander Major General Alan Luga and the Philippine National Police on Aurora Boulevard in Quezon City. She said, she, Panesa and two others were blindfolded. After hours of travel, they learned that they were taken to PNP Regional Office IV at Camp Vicente Lim in Canlubang, Laguna. Marites Chioco was also detained for hours and forced to admit that she is “Ka Luisa,” the wife of Benjamin Mendoza. Insisting that she is not, she was eventually released. Their two companions – their pregnant daughter and her husband – were also released. She said Panesa sustained injuries while he was in detention. He is detained at the Security Intensive Care Area (SICA), Metro Manila District Jail for rebellion and frustrated murder. “By way of emphasis, it must be stated that Rolly’s personal circumstances belie the claims of those who arrested him that he is ‘Benjamin Mendoza,’ and this can be verified through proper inquiry and investigation. Likewise, his employment records, which further establish that he is Rolly Mira Panesa, can be easily verified, since he is employed in a government-regulated industry under the supervision of the same enforcement agency which had him in custody,” the petition stated. “The warrant of arrest and the commitment order issued against ‘Benjamin Mendoza’ cannot be made as basis for the continued detention of Rolly,” it further stated. Respondents in the petition include Inspector Bernardino Edgar T. Camus, jail warden of the Security Intensive Care Area (SICA), Metro Manila District Jail; Maj. Gen. Alan Luga, Commanding General of the AFP Southern Luzon Command (SOLCOM); Maj. Gen. Eduardo D. del Rosario, Commanding General, 2nd Infantry Division, Philippine Army; P/CSupt. James Andres B. Melad, Regional Director, Philippine National Police Regional Office IV; and, P/SSupt. Manuel M. Abu, Chief of the Regional Intelligence Office of the PNP Regional Office IV. “Panesa’s illegal arrest, torture and continued illegal detention on the basis of trumped-up charges showcases the military’s arbitrariness in the conduct of its counterinsurgency program, the Oplan Bayanihan, and the government’s obsession to meet its self-imposed deadline to end the so-called insurgency,” said Cristina Palabay, secretary general of human rights group Karapatan.